When I first heard about cloth diapers I was a member of a message board for parents of multiples. There really was no cloth diapering section but there were a few moms who cloth diapered and and had pictures of their little ones in cloth. After taking the plunge and buying my first little mini-stash of gently used cloth diapers off of one of those mamas I was also told about the existence of entire communities online, massive forums, dedicated to the sole purpose of cloth diapering. I must say, it was overwhelming to see but also a relief to know that there were so many other families that were using cloth diapers and everyone was super willing to give their support and share their knowledge. Since then there's been a dramatic increase in blogging, particularly blogging mommies and wahm business owners. Also the debut of FaceBook Fan Pages, Twitter and many other social networking sites, most of which I am still unfamiliar with. I am curious as to where all you cloth diapering mamas hang out online? Do you find that you now spend less time on message boards and more time on Twitter or are you a FaceBook addict? Do you chat with fellow cloth diapering moms on the various fan pages or participate in Twitter parties or scheduled chats? Are you obsessed with entering giveaways or following all your favorite mom bloggers? Are you now a blogger yourself, trying to make a name for yourself and develop a following? We'd love for you to leave your comments and share how you feel the popularity of various social networking tools has affected what and where you hang out online and where you turn for all your cloth diapering info and resources. I love the gdiapers yahoo group. You can find the link at the top of gdiapers.com. That group has changed my life! Not only do they talk about gdiapers, but they talk about cloth diapering in general, green living, parenting, and much more. This was the group that inspired me to start nappyshoppe.com! I use Facebook the most. Then Twitter. 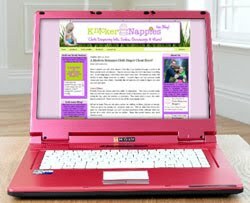 #clothdiapers Diaperswappers.com forum is wonderful rescource for information, although it can be overwheming for a mom just looking for info to get started. Now that B is a very active toddler, I just don't have time for diaperswappers. I also follow a few blogs that help keep me "in the know" about what is new and offer great diaper reviews. theclothdiaperreport.com is my favorite. Twitter, Facebook, and blogs via Google Reader work well for me! Oh my gosh that is SO CUTE!!! I can't wait to see her tomorrow! When I was investigating cloth diapering about 5 years ago, I couldn't find anything online about it! But when I tried again about a year ago, I found lots of people selling and buying on Craigslist, then a friend referred me to Diaperswappers (but it is kind of overwhelming to me) and then recently I have found facebook groups like nappyshoppe and all natural baby center - I like to read the comments and opinions of how different diapers work. I also discovered Etsy and then decided to try and start making my own diapers too (learned from the website diaperjungle.com), I have also made a few wool diaper covers from some recycled sweaters. I've been part of quite a few message boards and like that one the most for different reasons. It use to be pretty mainstream in some areas but does have sections for BFing and cloth diapering. --- http://www.diaperswappers has a forum too but I think it's very "high schoolish"--immature, a lot of "look at me" and "Who's better? Let's compare!" type posts. It's very compartmentalized too and there is a lot of advertising on it so I try to use it just for FSOT section. I'm always open to a crunchier board so I can't wait to see what this turns up. I'm also on Facebook and Twitter (@CrunchyBabe) but I don't do much on Twitter anymore, just don't have time. I hang out on www.thebump.com, specifically their Eco Friendly Family board. Great group of ladies. Plus I have a lot of other things in common. Definitely DiaperSwappers more than anywhere else, but I prefer the sections of it that are less of a specific community and more of an open Q&A forum. I also like WhatToExpect.com's green parenting board. Great question! I want to go check out some of these other spots! I hang out on www.diaperswappers.com, where you can do for sale/trade diapers but also where there is a very active community! I also do "Life With a Babe" on MDC; while not everyone cloth diapers there, enough do that you can have a conversation or ask questions! I hang out with Jamie at The Mommy Playbook cloth diapering forum. I really like the BTLdiapering yahoo group - I like the yahoo group interface better than online forums. When I used gdiapers I also liked the gdiaper yahoo group (Hi Sharni!) and it's a good group for other stuff too.